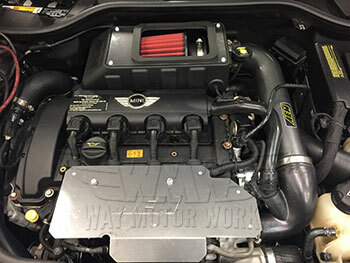 AEM Cold Air Intake for 2007-2013 R55 R56 R57 R58 R59 MINI Cooper S. This AEM intake is has an open air box that mounts to the stock bottom airbox half. 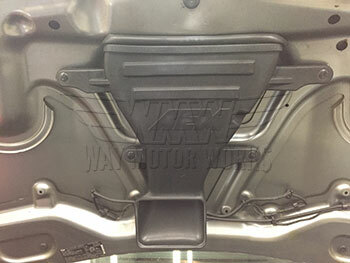 The top of the box is open to connect to the AEM air duct that mounts to the hood and makes the hood scoop functionable. This gets the maximium amount of cold air to the high flow dry air filter. Then the intake has an aluminum tube on the N14 version that takes the air to the AEM silicone adapter into the the Turbo. This also contains a turbo heatshield to keep the heat away from the duct. 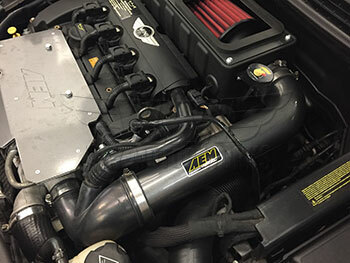 This intake will increase intake noise and throttle response. If ordering for the N18 engine kit will be black and NOT have the tube going to the turbo as you will reuse the stock tube due to the sensors incorporated into it. I purchased mine direct from AEM last year and I have had a lot of trouble keeping the Air filter on my MAFS. I like the product as I think it has increased performance, I just wish the filter would stay on!